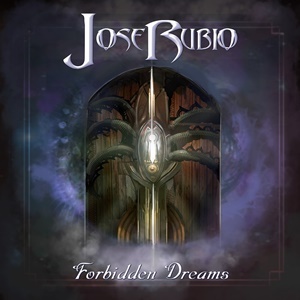 Mainly known as a guitarist with heavy/power metal acts like War Cry, Nova Era, and Evil Hunter among others, Jose Rubio also enjoys delivering instrumental metal efforts – of which Forbidden Dreams is his latest. Taking on all instruments and compositions, this eight-track affair delves into a virtuoso world, spreading all facets of melodic and intricate skill sets that reverts to a time when axe aficionados couldn’t wait for more during that 80’s/early 90’s wave where Vinnie Moore, Marty Friedman, Jason Becker, Joe Satriani, and Tony MacAlpine grabbed solid sales and market share. Jose subscribes to versatility at his instrument – the layers of clean to distorted guitar set up proper riffs and runs that he chooses to build intuitively, sometimes using slower, thoughtful breaks instead of ramping things up always at blitzkrieg paces. Check out “Infinity” for instance as the main passages are quite uplifting against a straightforward bass/drum tempo, his multiple lead phrases using a prism-like atmosphere where tapping and harmonies drive home the musical message – giving the listener a space odyssey in a Maiden meets Dream Theater-ish state. Occasionally a shorter effort like the under two-minute “Until the End (The Red String Legend)” peaks a bit into some older heroes, his choice of holding out note bends against a subtle keyboard/piano supplementation taking on Gary Moore-ish emotive angles while the arpeggio burst appears at the conclusion. Even when he chooses to employ a ballad framework for “Without You”, Jose knows how to build up and break down the feel and movement through proper mechanics – never losing the plot so to speak regarding refrains and aural markers that the listener can delve deeper into against his fluid guitar grace and equally praiseworthy keyboard solo. The willingness to mix things up keeps this 34-minute and change outing away from ear fatigue – a key component in why instrumental albums in the metal landscape have been making a solid comeback. Listeners are fine if a guitarist can take power, progressive, and traditional angles and then mix up a little funk/blues/southern rock nuance if it makes sense – as such, Forbidden Dreams should be a delight for those into Joe Satriani, Vinnie Moore, and lovers of melodic metal in general.